Seismological Society of America > News > Annual Meeting > How Big Can a Tsunami Be in the Caribbean? How Big Can a Tsunami Be in the Caribbean? 16 May 2018–The 2004 Indian Ocean tsunami has researchers reevaluating whether a magnitude 9.0 megathrust earthquake and resulting tsunami might also be a likely risk for the Caribbean region, seismologists reported at the SSA 2018 Annual Meeting. “Before 2004, we thought an earthquake of about 8.0 was about right for the largest we might see in the Caribbean, based on the history of earthquakes there and the length and motion of the faults,” said Christa von Hillebrandt-Andrade of the National Oceanic and Atmospheric Administration (NOAA). “But now some think that several faults in the region could be capable of producing earthquakes of 8.6, and the catastrophic planning by our emergency management community is considering 8.5 and 9.0 earthquakes,” she noted. The region contains several large subduction zones and faults, most of which are located offshore and are challenging to study. One particular focus is the subduction zone associated with the Puerto Rico Trench, located north of Puerto Rico and roughly on the border of the Caribbean Sea and Atlantic Ocean. A large earthquake on the Trench could produce a tsunami that reaches Puerto Rico within 20 minutes, and might be felt as far away as the U.S. Eastern seaboard. There is no historical evidence of any megathrust 9.0 earthquakes taking place on the trench, and the fault there has “a bit of oblique motion that takes up some of the energy and doesn’t create the big offset of the seafloor creating the tsunami” that would be expected from a straightforward subduction zone, von Hillebrandt-Andrade said. Another concern is a tsunami generated by submarine landslides that might occur after a more moderate-sized earthquake, she noted, adding that researchers have uncovered traces of very large landslides along the steep parts of the seafloor along the trench. Other regions that seismologists are keeping a closer eye on include the Lesser Antilles, the Dominican Republic, and the area offshore north of Panama. von Hillebrandt-Andrade said emergency management planners often work with “scenarios”—how a magnitude 9.0 earthquake and tsunami would impact a region—instead of focusing on the probabilities of a certain-level tsunami taking place within a specified time range. As seismologists continue to work out the recurrence rate of earthquakes in the region, von Hillebrandt-Andrade said researchers also are beginning to look at probabilistic tsunami hazards, beginning in the American Caribbean. More Caribbean paleoseismology–identifying and analyzing the evidence of past earthquakes—would also help researchers pinpoint the recurrence times of possible large earthquakes, von Hillebrandt-Andrade said. Since 2005, 48 countries and territories organized under the UNESCO IOC Intergovernmental Coordination Group for Tsunamis and Other Coastal Hazards for the Caribbean and Adjacent Regions have been developing a tsunami warning system. 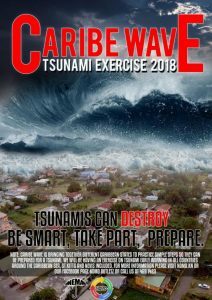 Tsunami response exercises, such as the annual CARIBE Wave draw on seismic hazard research findings to guide their practice scenarios.